An All-ACC selection, Curry was a second-round draft choice by the Falcons for 1980, one of four linebackers they took. Starting on the inside, he combined with fellow rookie Al Richardson (who he ended up sharing AP Defensive Rookie of the Year honors with), veteran Fulton Kuykendall, and second-year OLB Joel Williams to create an outstanding corps of linebackers. Falcons went 12-4 to finish first in the NFC West with the best record in the conference. Lost NFC Divisional playoff to Dallas Cowboys (30-27). Curry had another solid season in 1981, despite the team’s overall decline, and scored his only NFL touchdown on an interception return. 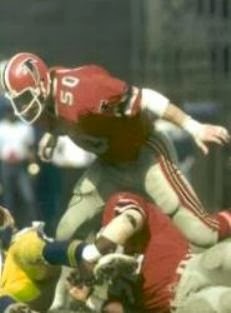 He led the Falcons in tackles in the strike-shortened ’82 season (something he regularly did throughout his career), but a knee injury prevented him from appearing in the playoff game afterward. Moved to the outside in 1983, Curry recorded a career-high four sacks, but was shifted to the middle as the team went to a 4-3 defense in ’84. After appearing in 105 straight games through 1986, Curry was limited to four games due to injury in ’87 and retired in the offseason. Overall, he played eight years with the Falcons and led the team in tackles in each of the first seven.